The perfect way to begin your students' school day! Cross-curricular daily practice gets your first grade students focused and engaged—and ready to learn. 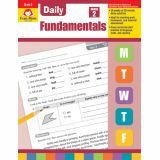 The daily lessons provide practice of language, math, and reading skills that support your core curriculum. The perfect way to begin your students' school day! Cross-curricular daily practice gets your second grade students focused and engaged—and ready to learn. The daily lessons provide practice of language, math, and reading skills that support your core curriculum. Students will be proud to have their very own books, and teachers will love watching their progress! My Own Books feature word lists, writing ideas and tips, plus plenty of space for students to build vocabulary, create stories and journal thoughts. Ready-to-color covers add to the fun. 32 pages, 8-1/2" x 7". Aligned with Common Core and State Standards. Supports requirements of Title I and other federally funded programs. Use word searches, crosswords and matching activities to gain knowledge of spelling patterns and tricky words. Each set contains 25 cards. Self correcting. For use with the Smart Tray® (sold separately). 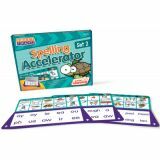 Fast Track your spelling with Tom the Turtle and the Smart Tray! Help children spell their way to success! Strong spelling is the blueprint children need to become masters of communication. Spectrum Spelling® for grade 1 engages learners with fun, full-color puzzles and riddles to keep them entertained while they build an essential skill that lasts a lifetime. Give your first grader a fun-filled way to build and reinforce spelling skills. Spectrum Spelling for grade 1 provides progressive lessons in letter recognition, short vowels, long vowels, sight words, and dictionary skills. This exciting language arts workbook encourages children to explore spelling with brainteasers, puzzles, and more! Don't let your child's spelling skills depend on spell-check and autocorrect. Make sure your child has the knowledge and skills to spell words with confidence–and without assistance from digital sources. 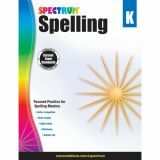 Complete with a speller's dictionary, a proofreader's guide, and an answer key, Spectrum Spelling offers the perfect way to help children strengthen this important language arts skill. Help children spell their way to success! Strong spelling is the blueprint children need to become masters of communication. Spectrum Spelling® for grade 2 engages learners with fun, full-color puzzles and riddles to keep them entertained while they build an essential skill that lasts a lifetime. Give your second grader a fun-filled way to build and reinforce spelling skills. Spectrum Spelling for grade 2 provides progressive lessons in contractions, vowel sounds, compound words, word endings, and dictionary skills. This exciting language arts workbook encourages children to explore spelling with brainteasers, puzzles, and more! Help children spell their way to success! Strong spelling is the blueprint children need to become masters of communication. 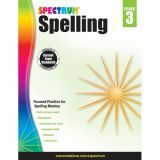 Spectrum Spelling® for grade 3 engages learners with fun, full-color puzzles and riddles to keep them entertained while they build an essential skill that lasts a lifetime. Give your third grader a fun-filled way to build and reinforce spelling skills. Spectrum Spelling for grade 3 provides progressive lessons in homophones, contractions, vowels, compound words, commonly used words, and dictionary skills. This exciting language arts workbook encourages children to explore spelling with brainteasers, puzzles, and more! Help children spell their way to success! Strong spelling is the blueprint children need to become masters of communication. Spectrum Spelling® for grade 4 engages learners with fun, full-color puzzles and riddles to keep them entertained while they build an essential skill that lasts a lifetime. Give your fourth grader a fun-filled way to build and reinforce spelling skills. 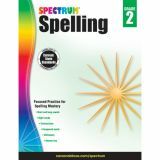 Spectrum Spelling for grade 4 provides progressive lessons in prefixes, suffixes, vowel sounds, compound words, easily misspelled words, and dictionary skills. This exciting language arts workbook encourages children to explore spelling with brainteasers, puzzles, and more! Help children spell their way to success! Strong spelling is the blueprint children need to become masters of communication. 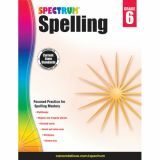 Spectrum Spelling® for grade 5 engages learners with fun, full-color puzzles and riddles to keep them entertained while they build an essential skill that lasts a lifetime. Give your fifth grader a fun-filled way to build and reinforce spelling skills. Spectrum Spelling for grade 5 provides progressive lessons in prefixes, suffixes, vowel combinations, variant consonants, rhyming words, and irregular plural nouns. This exciting language arts workbook encourages children to explore spelling with brainteasers, puzzles, and more! Help children spell their way to success! Strong spelling is the blueprint children need to become masters of communication. 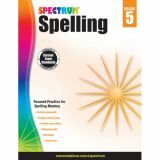 Spectrum Spelling® for grade 6 engages learners with fun, full-color puzzles and riddles to keep them entertained while they build an essential skill that lasts a lifetime. Give your sixth grader a fun-filled way to build and reinforce spelling skills. Spectrum Spelling for grade 6 provides progressive lessons in diphthongs, regular plurals, irregular plurals, related words, Greek and Latin roots, and dictionary skills. This exciting language arts workbook encourages children to explore spelling with brainteasers, puzzles, and more! Help children spell their way to success! Strong spelling is the blueprint children need to become masters of communication. Spectrum Spelling® for kindergarten engages learners with fun, full-color puzzles and riddles to keep them entertained while they build an essential skill that lasts a lifetime. Give your kindergartener a fun-filled way to build and reinforce spelling skills. Spectrum Spelling for kindergarten provides progressive lessons in letter recognition, short vowels, sight words, and dictionary skills. This exciting language arts workbook encourages children to explore spelling with brainteasers, puzzles, and more!